The reception in the lower ground floor of The Dubai Mall has undergone an aesthetic facelift. Visitors now step into the spacious lobby with several ticketing counters as well as digital self-ticketing kiosks. As the guests set to start the At the Top, Burj Khalifa journey, the ambience changes; white gradient glass walls provide an illusion of clouds, highlighting the heights they will scale soon and giving a first glimpse of a 4-metre illuminated model of Burj Khalifa. A giant video wall creates a spellbinding ‘movement art’ of all visitors. Sensors gather the presence of every individual visitor, his/her location and movement, and turn them into real-time digital art. The screen uses three different themes – sea water, desert rocks and mosaic motifs – to interact with the audiences. These dynamic, free-flowing art pieces will be much-loved by children and adults alike. 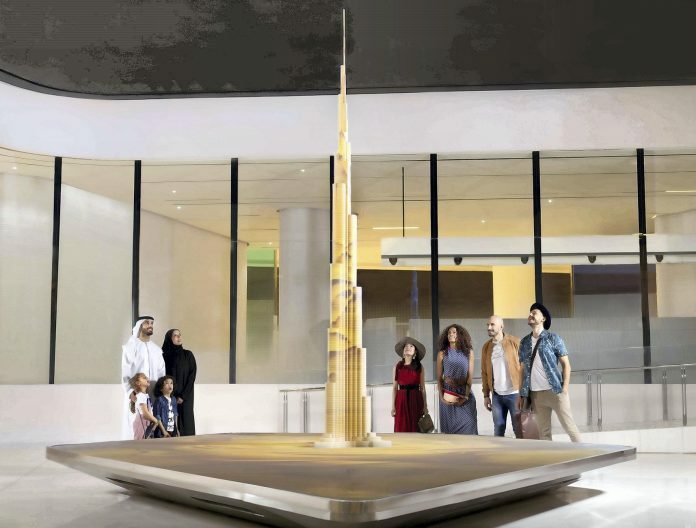 A replica of Burj Khalifa comes to life with digital projections in four different themes – cloud, water, sand and glass – providing visitors a feel of the vastness and height of the tower.